Trust us that your personal data is safe, protected and secure. 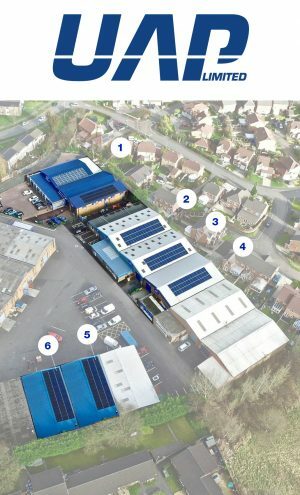 UAP Ltd is situated in North Manchester (conveniently located right next to the M60 motorway and the A56) and we have an unrivalled reputation for product excellence, innovation and quality. We are a leading door hardware supplier in the UK and working in conjunction with highly-regarded and respected manufacturers in order to guarantee that every piece of merchandise is of a superior standard. From standard, everyday stocked items, right through to completely original bespoke products, UAP Limited can offer you a diverse and broad reaching collection of door hardware, which caters for a multitude of purposes. Customers will always receive a professional level of service every step of the way, as our team will do everything in our power to guarantee 100% consumer satisfaction every time. What is GDPR and Personal Data? Generic email addresses such as sales@company.com is not classed as personal data, and does not come under GDPR. On 25th May 2018, it became illegal for a company to contact you using personal data without you previously giving your full consent for them to do so! Want us to keep in touch with you? We’d love to be able to contact you so we can let you be the first to know about new products, as well as receive exclusive discounts and free gifts. We will also email you digital copies of our free UAP technical magazines, keeping you up to date with the latest test standards and product specifications. Simply fill out your details below and click the green button. We will then send you an email to confirm that you are happy for us to contact you, and once you click the link to confirm, we will add you to our database. It’s that simple! What data do we keep and what is it used for? Please find below the personal data we collect for UAP and our group of companies, and the reasons why it is collected. We will only contact you with promotions if you have given us your consent, either verbally or through written communication. Unless you tell us otherwise, all consent for promotions will last a period of 5 years, after which we will contact you again to make sure you are still happy receiving contact from us. If consent is given, we will also email you from time to time to let you know about the latest security products and ways to secure your home. We will never pass on your details to a third party company unless it is a legal requirement for us to do so. If consent is given, we will also email and telephone you from time to time to let you know about our latest products and offers. We will never pass on your details to a third party company unless it is a legal requirement for us to do so. If consent is given, we will also email you from time to time to let you know about our latest products and ways to secure your home. We will never pass on your details to a third party company unless it is a legal requirement for us to do so. If you do not wish for us to process your personal data, please let us know below. We will never pass on your details to a third party company unless it is a legal requirement for us to do so. If consent is given, we will also email you from time to time to let you know about our latest products. We will never pass on your details to a third party company unless it is a legal requirement for us to do so. As a data subject, it is very easy to control your personal data, and manage what we send to you. All of our emails contain an unsubscribe button, so if you no longer want to receive any correspondence from us, then you can control it with a click of a button. As granted by the European legislator, you have the right to request, rectify or have deleted any personal data we hold about you. You can request this by filling out your email in the relevant section below. Each data subject shall have the right, as granted by the European legislator, to request and obtain for free from the data controller what personal data concerning a data subject are being held and processed by the data controller. If a data subject wishes to request personal data, they may at any time contact our data protection officer or another employee of the data controller either by submitting their email below, by emailing us directly at marketing@uapcorporate.com or by telephone on 0044 (0)161 796 7268. Once a request has been submitted, the data subject will be emailed to confirm that they still wish to go ahead with the request of their personal data. Once confirmed, they will be sent as soon as possible what personal data concerning a data subject are being held and processed by UAP. Each data subject shall have the right, as granted by the European legislator, to obtain from the data controller without undue delay the rectification of inaccurate personal data concerning a data subject. Taking into account the purposes of the data processing, the data subject shall have the right to have incomplete personal data completed, including by means of providing a supplementary statement. If a data subject wishes to rectify and update personal data, they may at any time contact our data protection officer or another employee of the data controller either by submitting their amendments and your email below, by emailing us directly at marketing@uapcorporate.com or by telephone on 0044 (0)161 796 7268. Once a request has been submitted, the data subject will be emailed to confirm that they still wish to go ahead with the request of their personal data. Once confirmed, UAP will without undue delay rectify any inaccurate personal data concerning a data subject. Each data subject shall have the right, as granted by the European legislator, to obtain from the data controller the erasure of personal data concerning the data subject without undue delay, and the data controller shall have the obligation to erase personal data without undue delay. If a data subject wishes to have their personal data erased, they may at any time contact our data protection officer or another employee of the data controller either by submitting their email below, by emailing us directly at marketing@uapcorporate.com or by telephone on 0044 (0)161 796 7268. Once a request has been submitted, the data subject will be emailed to confirm that they still wish to go ahead with the erasure of their personal data. Once confirmed, the data protection officer shall promptly ensure that the erasure request is compiled as soon as possible, but this can take up to 1 month from the date of request. In this policy, when we talk about UAP Limited and each of their respective subsidiaries (collectively “UAP”, “we”, “our” or “us”) we are referring to the company which provides the goods and services. As the data controller, we have implemented numerous technical and organisational measures to ensure the most complete protection of personal data processed through this website. However, Internet-based data transmissions may in principle have security gaps, so absolute protection may not be guaranteed. For this reason, every data subject is free to transfer personal data to us via alternative means, e.g. by telephone. Data subject is any identified or identifiable natural person, whose personal data are processed by the data controller responsible for the processing. The data controller or controller responsible for the processing is the natural or legal person, public authority, agency or other body which, alone or jointly with others, determines the purposes and means of the processing of personal data; where the purposes and means of such processing are determined by Union or UK law, the controller or the specific criteria for its nomination may be provided for by Union or UK law. The recipient is a natural or legal person, public authority, agency or another body, to which the personal data are disclosed, whether a third party or not. However, public authorities which may receive personal data in the framework of a particular inquiry in accordance with Union or UK law shall not be regarded as recipients; the processing of those data by those public authorities shall be in compliance with the applicable data protection rules according to the purposes of the processing. Third party is a natural or legal person, public authority, agency or body other than the data subject, data controller, data processor and persons who, under the direct authority of the data controller or data processor, are authorised to process personal data. The data subject may, at any time, prevent the setting of cookies through our website by means of a corresponding setting of the Internet browser used, and may thus permanently deny the setting of cookies. Furthermore, already set cookies may be deleted at any time via an Internet browser or other software programs. This is possible in most Internet browsers. If the data subject deactivates the setting of cookies in the Internet browser used, not all functions of our website may be entirely usable. Our websites collect a series of general data and information, when a data subject or an automated system calls up the website. (i) any other similar data and information that may be used in the event of attacks on our information technology systems. Therefore, UAP analyses these anonymously collected data and information, on one hand, statistically and besides with the aim of increasing the data protection and data security of our enterprise and, ultimately, to ensure an optimal level of protection for the personal data processed by us. The anonymous data of the server log files are stored separately from all personal data provided by a data subject. The data subject has the possibility to register on the website of the data controller with the provisions of personal data. Which personal data is transmitted to the data controller is determined by the respective input mask used for the registration. By registering on the website of the data controller, the IP address assigned by the Internet service provider (ISP) and used by the data subject, date and time of the registration are also stored. The storage of this data takes place in the background as this is the only way to prevent the misuse of our services and, if necessary, to make it possible to investigate committed offenses. Insofar, the storage of this data is necessary to secure the data controller. This data is not passed on to third parties, unless there is a statutory obligation to pass on the data or the transfer serves the aim of the criminal prosecution. (a) Registration account creation information: Data subjects may provide information such as an email address, phone number, address, company name, supplier name, receipt reference number, date of purchase, name of installing company and password to create an account. (b) Cylinder registration information: When a data subject registers a product on our website, in addition to the registration account creation information, we may also collect we may collect general data such as a key number, key description and key photo. (c) Billing and other information: For data subjects that purchase products or services either through our websites or any other means, our corporate affiliates and our third party payment processors may collect and store billing address and credit card information on our behalf or we may do this ourselves. We will also collect data relating to orders and deliveries. (d) Customer relationship management: This information may include administrative and support communications with us and information about products, orders, support, features, content, and links you interact with, and what third party integrations you use (if any). (e) Contact information: With your permission, any contact information you choose to share with us is collected (such as an email, telephone number or physical address) when using our products and services. (f) Third party data: We may also receive information from affiliates in our corporate group, our partners, or others that we use to make our own information better or more useful. This might be aggregate level information, such as which IP addresses go with which postcodes, or it might be more specific information, such as about how well an online marketing or email campaign performed, which also includes information on how you interacted with the email and any links you clicked on. The personal data entered by the data subject are collected and stored exclusively for internal use by UAP and for our own purposes. We, the data controller may request the transfer of personal data to one or more processors, for example, a parcel service, who also uses the personal data for an internal use, which is attributable to the data controller. (a) To understand and improve our services: We carry out research and analyse trends to better understand how customers are using our websites to help improve them. (b) To communicate with you by responding to your requests: If you contact us with a problem or question, we will use your information to respond. (c) To communicate with you by sending emails and messages: We may send you product and administrative emails and messages. We may also contact you to inform you about changes in our products, our service offerings, and important customer service related notices, such as security and fraud notices. These emails and messages are considered part of our service and you may not opt-out of them. In addition, we sometimes send promotional emails about new product features or other news about UAP. You can opt out of these at any time. (d) Communicating with you and marketing: We often need to contact you for invoicing, account management and other similar reasons. We may also use your contact information for our own marketing or advertising purposes. You can opt out of these at any time. (e) Billing and account management: We use account data to administer accounts and keep track of orders, billing and payments. This data may include your contact details, your payment details and the transaction details. The data may be processed for the purpose of supplying the purchased goods or served and keeping proper records of those transactions. The legal basis for this processing is, at your request, the performance of a contract between you and us. (f) Publication data: We may use information that you submit to us for publication on our website or in our magazines, for example generating a PR article when your company starts to take a new product from us. We will always get your full consent before any information is publicised, and you can opt out of these at any time. (g) Investigating and preventing bad stuff from happening: We work hard to keep all of our services secure and to prevent abuse and fraud. We may disclose your personal data to any member of our group of companies, which includes all of our subsidiaries including, but not limited to, Fullex Locks, MAX6MUM SECURITY, Quality Locks, Cars, Keys and Locks, Tradelocks, CitySafe and Genuine Lishi, insofar as reasonably necessary for the purposes and legal bases set out in this policy. We may disclose your personal data to our insurers or professional advisors for the purposes of maintaining insurance, managing risks, obtaining professional advice, and exercise of defence of legal claims, whether it be court proceedings or in an administrative or out-of-court procedure. Furthermore, it may be necessary to transfer personal data to a third country or to an International organisation. Where this is the case, the data subject shall have the right to be informed of the appropriate safeguards relating to the transfer. If a data subject wishes to avail himself of this right of access, he or she may at any time contact our data protection officer or another employee of the data controller. In addition, we may disclose your personal data where such disclosure is necessary for compliance with a legal obligation to which we are subject, or in order to protect your personal interests, or the vital interests of another natural person. Each data subject shall have the right, as granted by the European legislator, to request and obtain for free from the data controller what personal data concerning a data subject are being held and processed by the data controller. Each data subject shall have the right to receive the personal data concerning them, which was provided to a data controller, in a structured, commonly used and machine-readable format. If a data subject wishes to request personal data, they may at any time contact our data protection officer or another employee of the data controller either through our website portal found at www.uapcorporate.com/preference, through email by emailing marketing@uapcorporate.com or by telephone on 0044 (0)161 796 7268. Once a request has been submitted, the data subject will be emailed to confirm that they still wish to go ahead with the request of their personal data. Once confirmed, they will be sent as soon as possible what personal data concerning a data subject are being held and processed by UAP. Each data subject shall have the right, as granted by the European legislator, to obtain from the data controller without undue delay the rectification of inaccurate personal data concerning a data subject. Taking into account the purposes of the data processing, the data subject shall have the right to have incomplete personal data completed, including by means of providing a supplementary statement. If a data subject wishes to rectify and update personal data, they may at any time contact our data protection officer or another employee of the data controller either through our website portal found at www.uapcorporate.com/preference, through email by emailing marketing@uapcorporate.com or by telephone on 0044 (0)161 796 7268. Once a request has been submitted, the data subject will be emailed to confirm that they still wish to go ahead with the rectification of their personal data. Once confirmed, UAP will without undue delay rectify any inaccurate personal data concerning a data subject. If one of the above-mentioned reasons applies and a data subject wishes to request the erasure of personal data stored by UAP, they may at any time contact our data protection officer or another employee of the data controller either through our website portal found at www.uapcorporate.com/preference, through email by emailing marketing@uapcorporate.com or by telephone on 0044 (0)161 796 7268. Once a request has been submitted, the data subject will be emailed to confirm that they still wish to go ahead with the rectification of their personal data. Once confirmed, the data protection officer shall promptly ensure that the erasure request is compiled as soon as possible, but this can take up to 1 month from the date of request. Where UAP has made the personal data public and is obliged to erase the personal data, UAP will take in to account the availability of technology and the cost of implementation, and take reasonable steps, including technical measures, to inform other data controllers which are processing the personal data that the data subject has requested the erasure of any links to, or copy or replication of, those personal data, as far as data processing is not required. The data protection officer for UAP or another employee will arrange the necessary measures in individual cases. (c) The data controller no longer needs the personal data for the purposes of the processing, but they are required by the data subject for the establishment, exercise or defence of legal claims. If one of the abovementioned conditions is met and a data subject wishes to request the restriction of the processing of personal data stored by UAP, they may at any time contact our data protection officer or another employee of the data controller by emailing marketing@uapcorporate.com or by telephone on 0044 (0)161 796 7268. The data protection officer of UAP or another employee will arrange the restriction of the processing. Each data subject shall have the right, as granted by the European legislator, to object to personal data processing on grounds relating to their particular situation. This also applies to profiling based on these provisions. UAP shall no longer process the personal data in the event of the objection, unless we can demonstrate compelling legitimate grounds for the processing which override the interests, rights and freedoms of the data subject or for the establishment, exercise or defence of legal claims. If UAP processes personal data for direct marketing purposes, the data subject shall have the right to object at any time to the processing of personal data concerning them for such marketing. This applies to profiling to the extent that it is related to such direct marketing. If the data subject objects to UAP to the processing for direct marketing purposes, UAP will no longer process the personal data for these purposes. The data subject has the right, on grounds relating to his or her particular situation, to object to processing of personal data concerning them by UAP for scientific or historical research purposes or statistical purposes, unless the processing is necessary for the performance of a task carried out for reasons of public interest. In addition, the data subject is free in the context of the use of information society services, to use their right to object by automated means using technical specifications. If a data subject wishes to object to their personal data being processed, they may at any time contact our data protection officer or another employee of the data controller either through email by emailing marketing@uapcorporate.com or by telephone on 0044 (0)161 796 7268. Once a request has been submitted, the data subject will be emailed to confirm that they still wish to go ahead with the rectification of their personal data. Once confirmed, UAP will without undue delay rectify any inaccurate personal data concerning a data subject. Each data subject shall have the right, as granted by the European legislator, to withdraw their consent to processing of their personal data at any time. If the data subject wishes to exercise the right to withdraw the consent, they may at any time contact our data protection officer or another employee of the data controller either through email by emailing marketing@uapcorporate.com or by telephone on 0044 (0)161 796 7268.